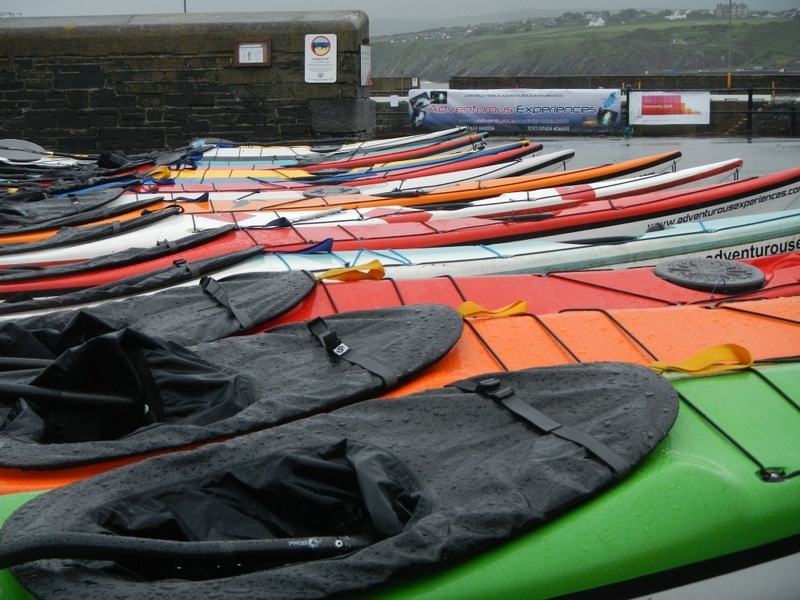 kayakism | Sea kayaking from the Isle of Man. 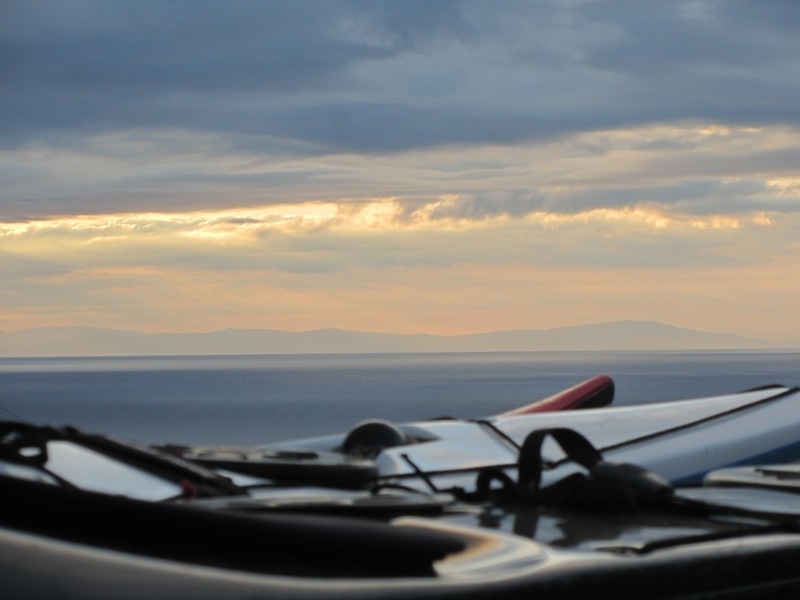 kayakism Sea kayaking from the Isle of Man. 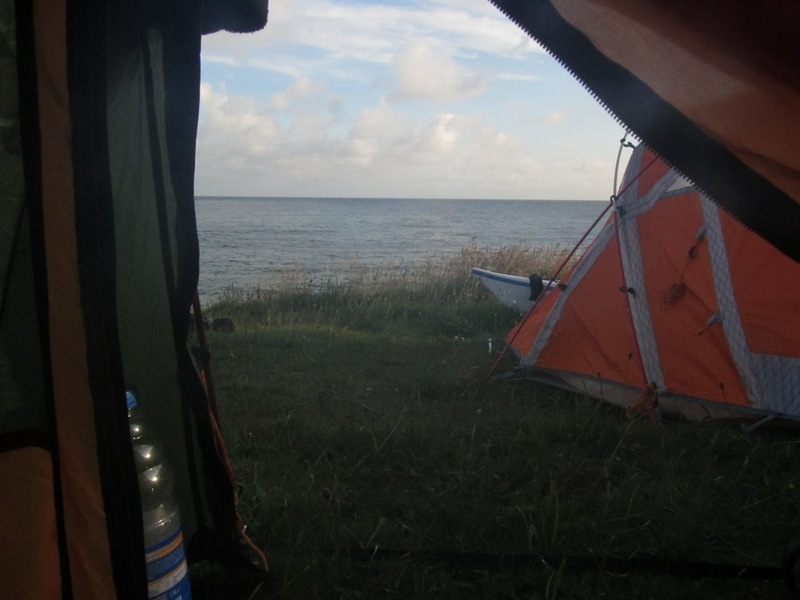 Day three dawned, after a quiet night, a little breezey but looked ok. We made a brew stuffed some porridge down and got packed up. 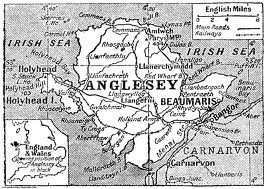 I was a little apprehensive of what it was going to be like one the west coast of Anglesey when we left the shelter of the straits. The last few days of south westerlies had given the sea a chance to build. We still had the four major tidal races to negotiate on this coast also. 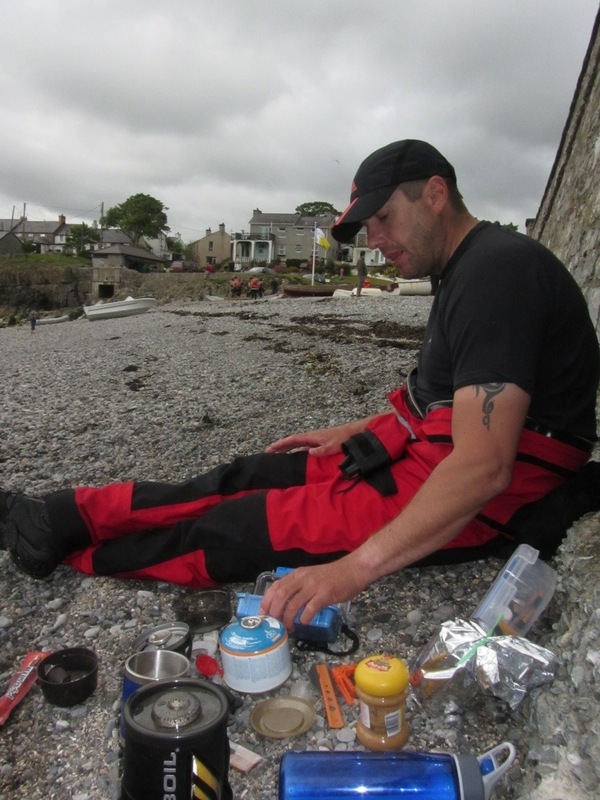 We had been over our timings however and were pretty confident that we could make it back to Holyhead today. 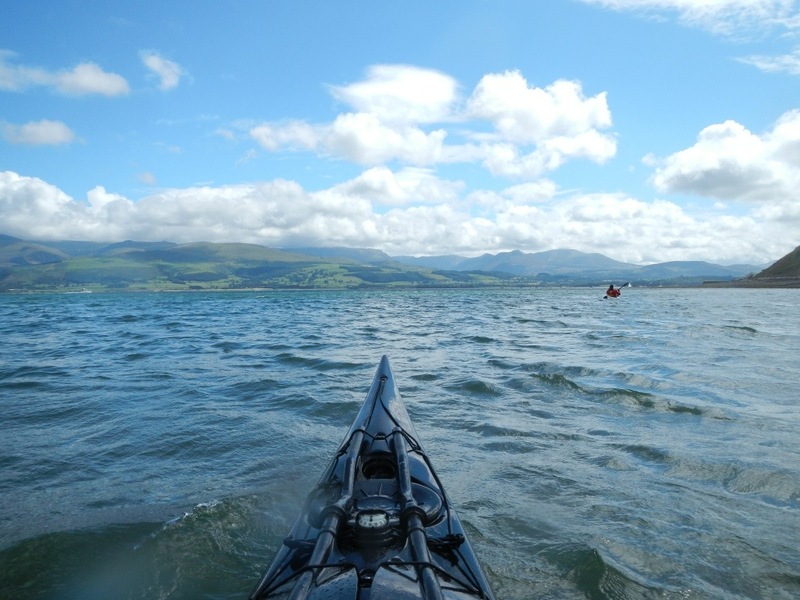 We made an early start and headed into the wind for the final part of the Menai Straits past Caernarfon castle and on to Abermenai point where we would turn right (again) and finally head north on the home straight. 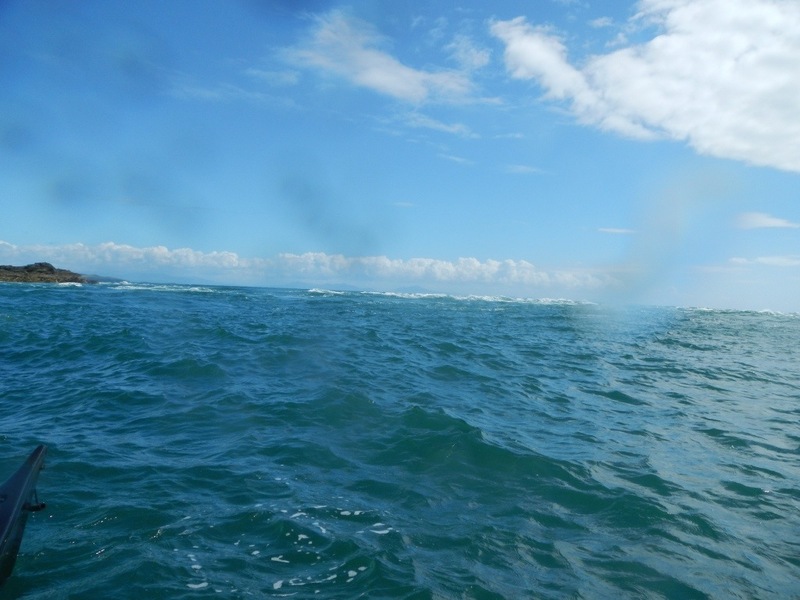 The sea state was not overwhelming when we did exit the straits but it was going to be hard going for the final 40k. 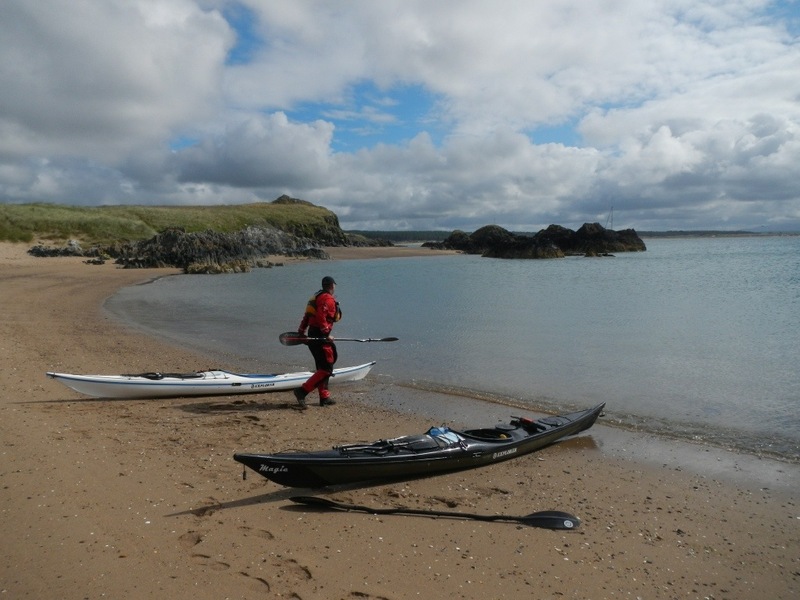 Our first stop of the day was at a beautifully sheltered beach on a tiny peninsular just off Newborough forest. Stunning. Out of the wind the sun warmed us up and I could have happily sunbathed here all day. 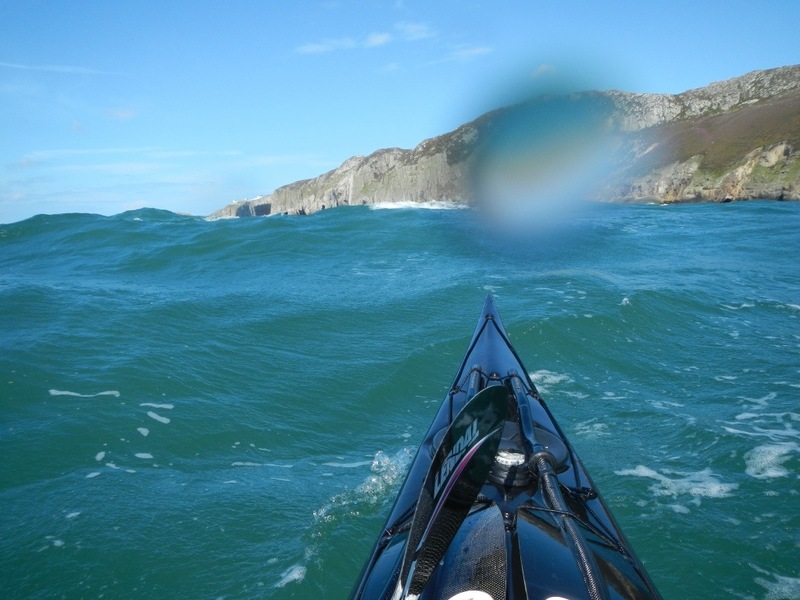 It was a bit lumpier round the back and it stayed that way as we headed around the coast past the Anglesey motor racing circuit and then cut across the massive bay at Rhosniegr and RAF Valley towards Rhoscolyn. Nothing in the way of tide at Rhoscolyn thankfully. So we pushed on to the welcome of Trearddur Bay. Not far to go now we stopped for a comfort break and a tasty cheeseburger! 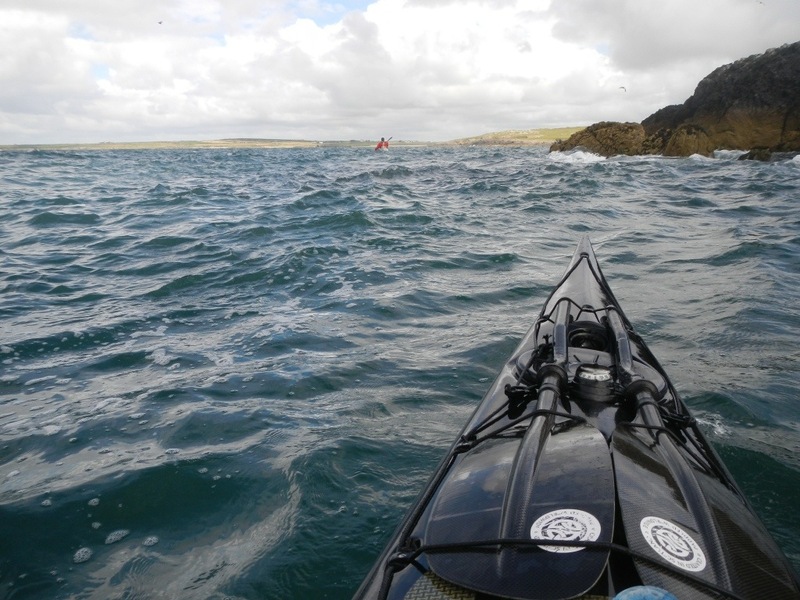 Definitely on the home stretch now only three of the most fearsome tidal races know to man to negotiate. We snuck through Penrhyn Mawr with no problem. Back tomorrow for a play! 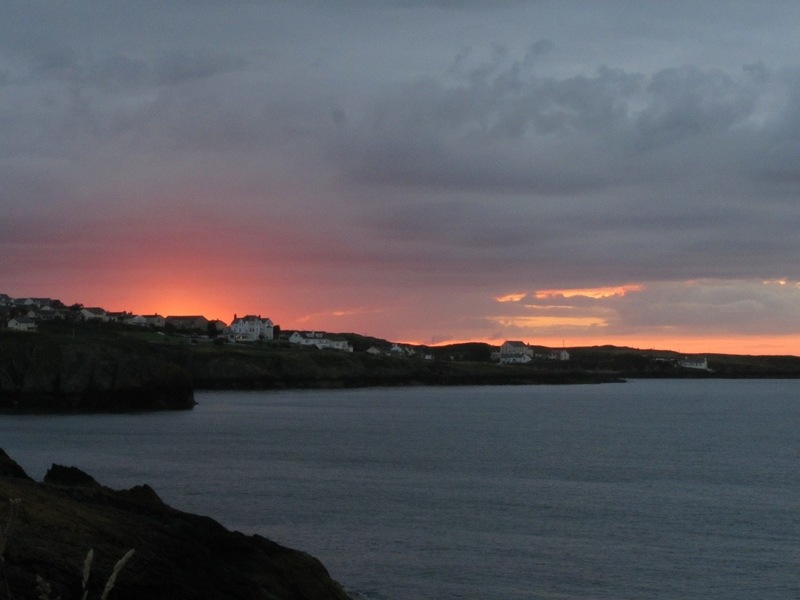 Then the welcoming sight of South stack. 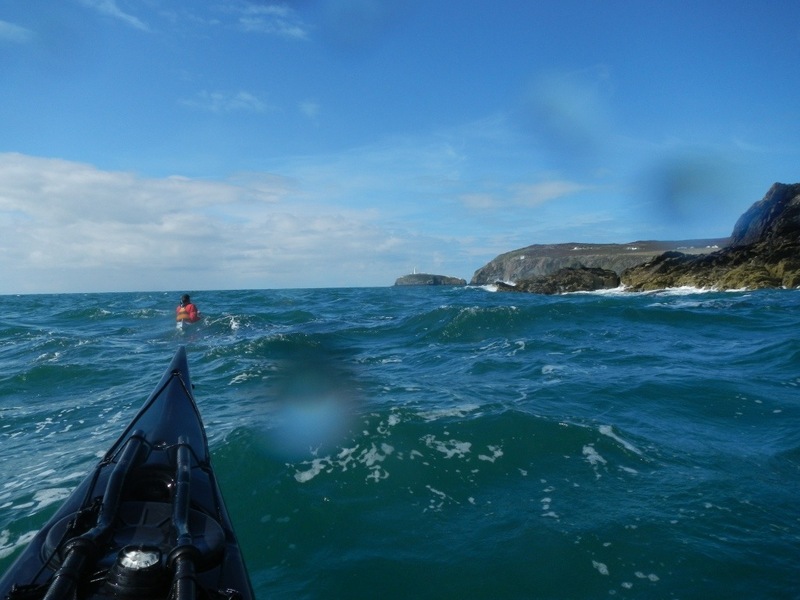 Things got a bit lively on the approach to North stack but after punching through it was calm water for the rest of the trip. Just the small matter of the Holyhead breakwater, which at 2.7 km’s turns out to be the longest in the uk! Time for the pub. A great trip. Two and a half days well spent. After a very pleasant night the wind had lifted a bit but it still looked set to be a beautiful day. Not far to our first significant waypoint of the day. 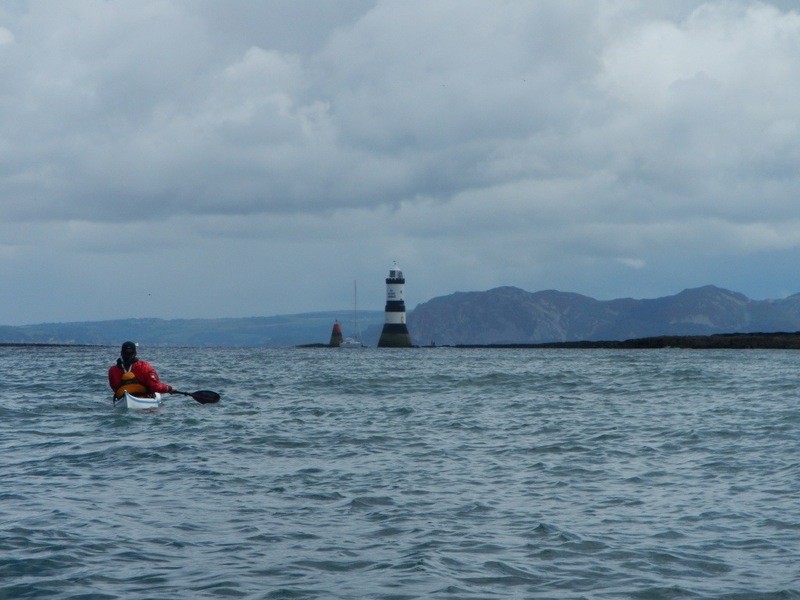 The lighthouse at Point Lynas marks the proper right turn to start the downhill run towards the Menai Straits. 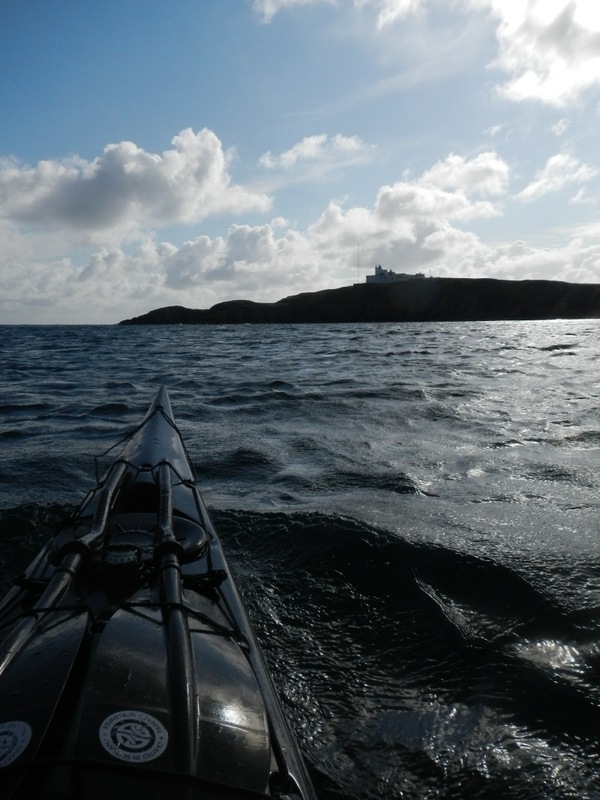 It is possible to cross directly to Puffin Island at the northern entrance to the straits but with an offshore wind and to make the journey more interesting we decided to follow the coastline. 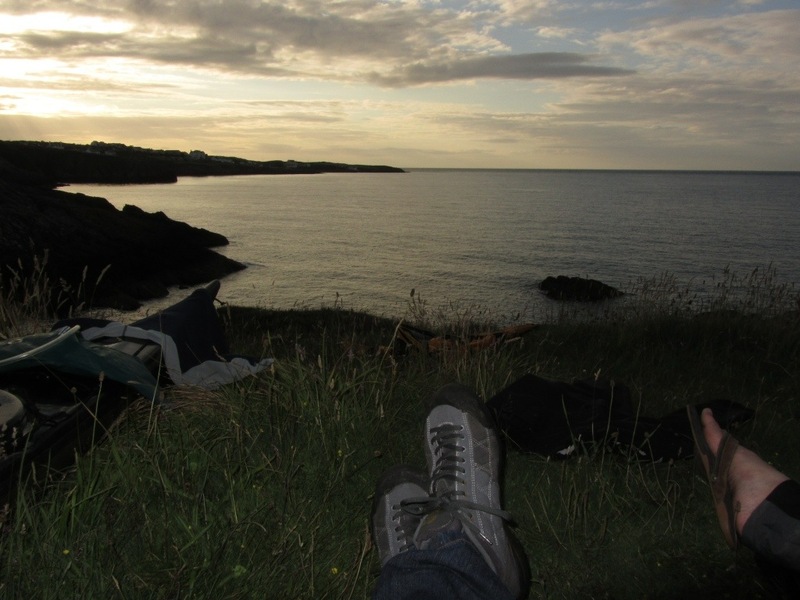 In the shelter of the cliffs after rounding the point the sun warm and the sea calm. 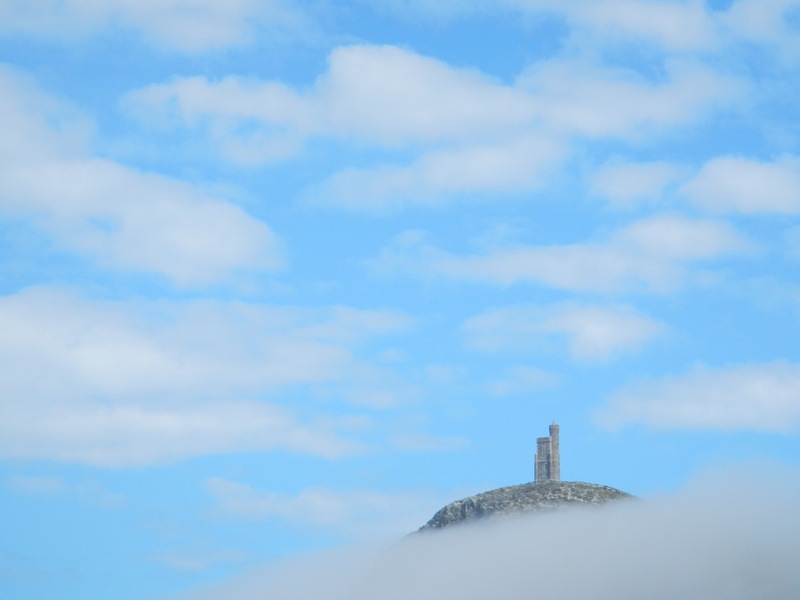 The unusual lighthouse sits 39 meters above the high tide mark and is visible from some 20 miles away. It is fully automated now and controlled from Holyhead. The surrounding cottages once used for housing the staff for the lighthouse and telegraph station that was on the same site are now holiday cottages in a terrific location. 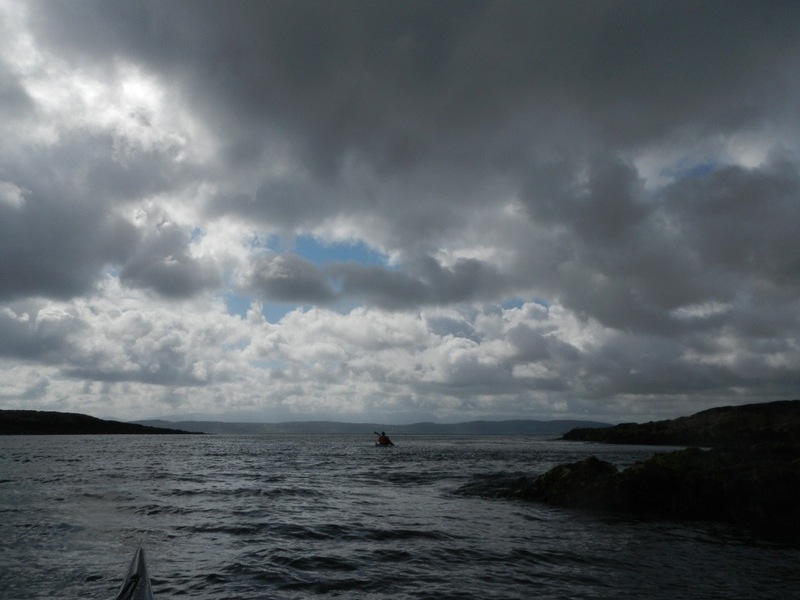 The clouds had started to gather as we pushed on south east past the lovely Dulas bay. when it seemed like a good time to stop for brunch. Suitably refreshed we got back on the water just before the torrential downpour. My sun hat not faring well against the onslaught. 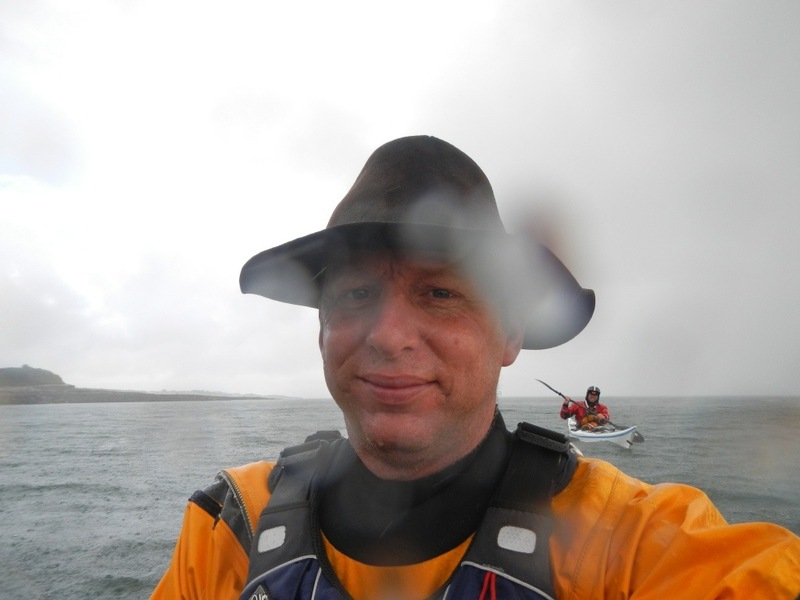 There is something quite surreal and very relaxing paddling in heavy rain. It did not last too long. 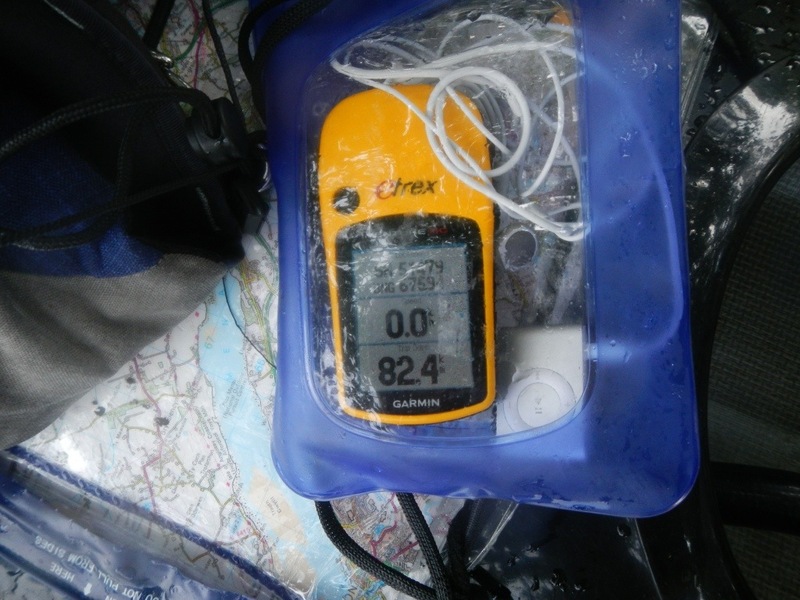 Although there was definite increase in wind speed after the rain had passed. We slogged around Red Wharf bay which seemed to go on forever but soon enough the next milestone of the lighthouse at Penmon point. 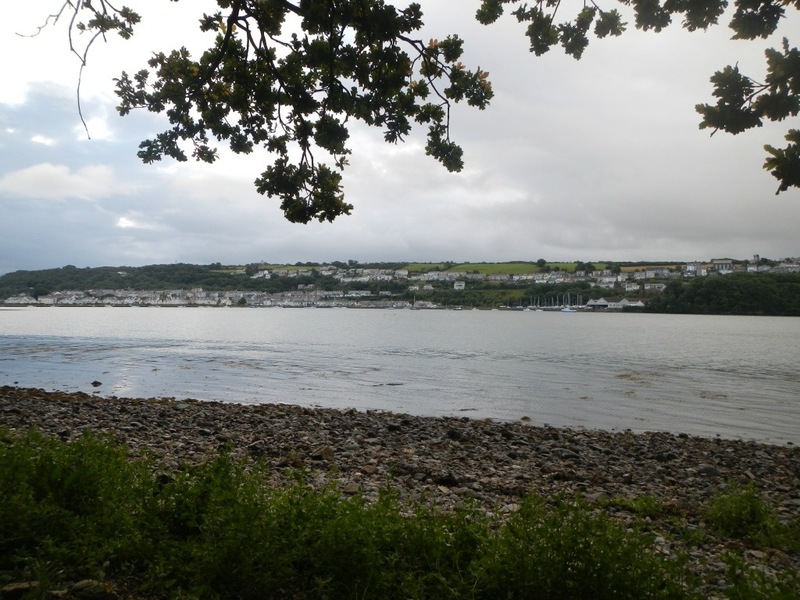 This signifies the start of the Menai straits where we were hoping to gain some assistance from the tide. 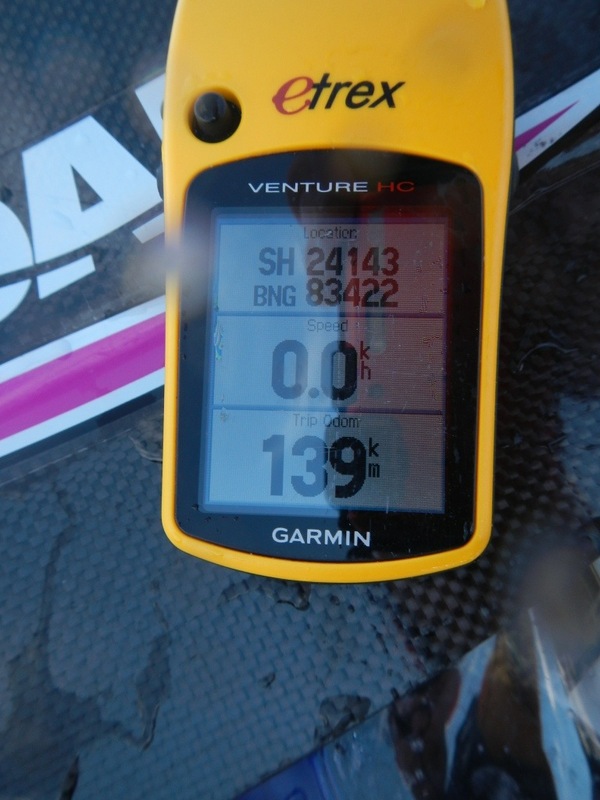 This however was not to be as the wind had now reached a fair force 4 from the south west which provided a very stiff head wind. looked nice though! 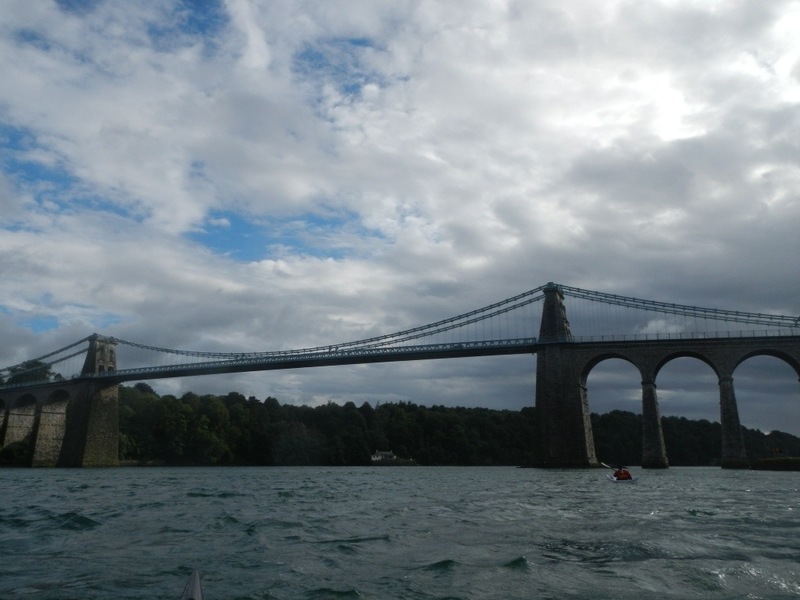 I’m uncertain how many hours we battled against the wind to reach the town and very distinctive Menai Bridge. 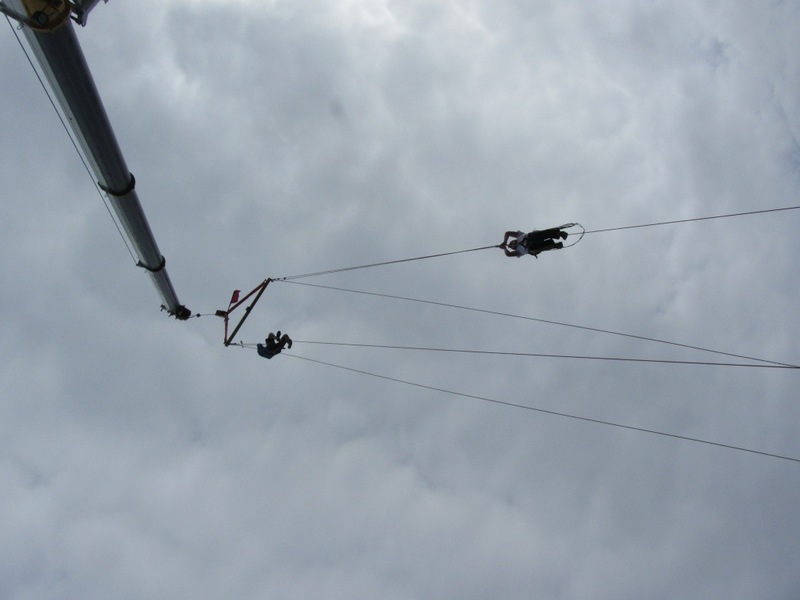 I do know it was not as much fun as I had hoped! Tired and hungry we pulled in at the slipway with the help of a very friendly attendant who not only directed us to the fish and chip shop but also donated half a box of biscuits to the cause. Very much appreciated thank you. 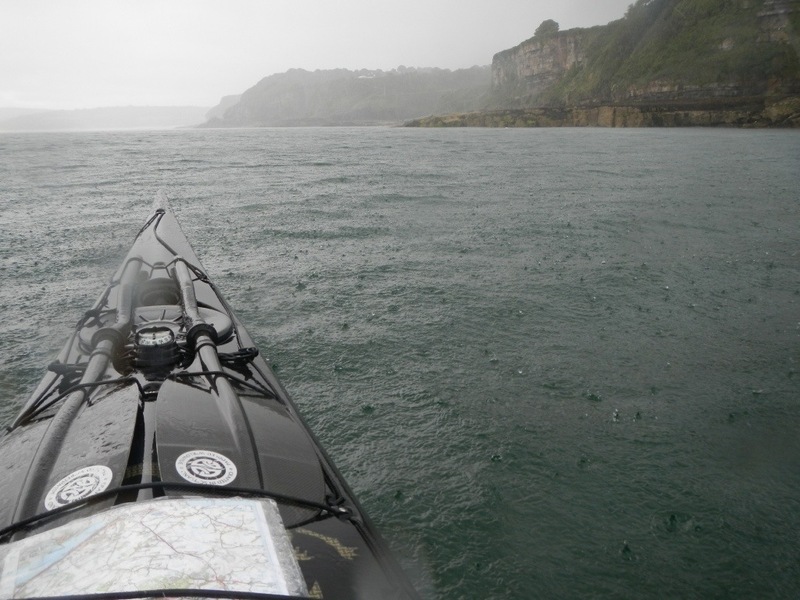 After consuming enough calories to cover the following week, we returned to the straits to find the wind had dropped and the tide was in our favour. 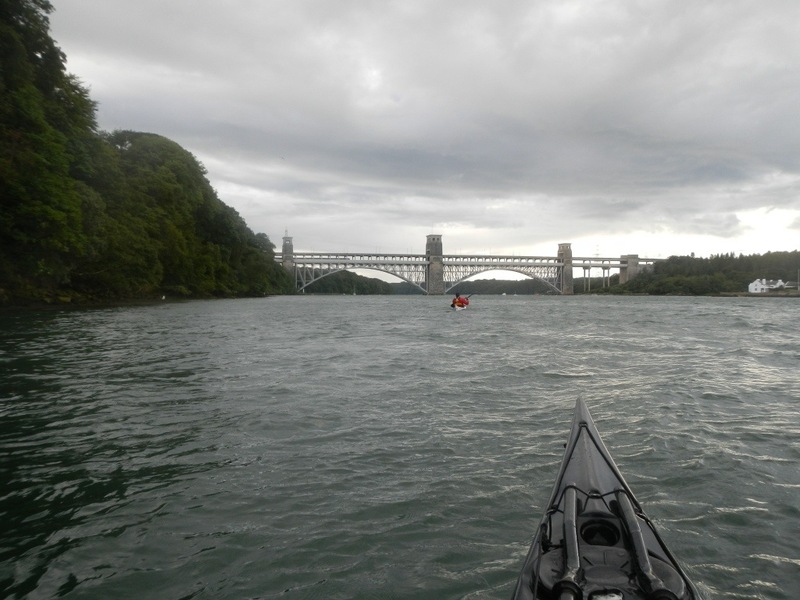 We fair flew under the Britannia bridge. 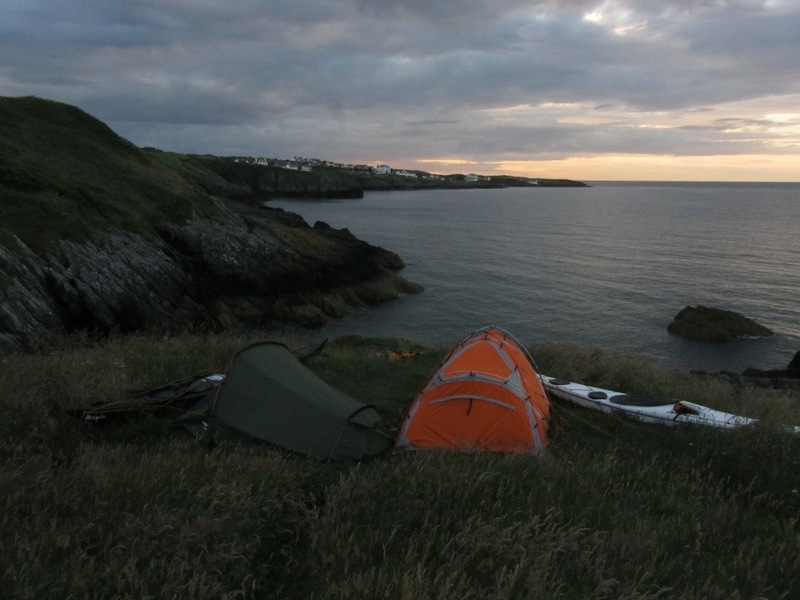 We continued on for a few k’s more and then snuck under some bushes to camp for the night. 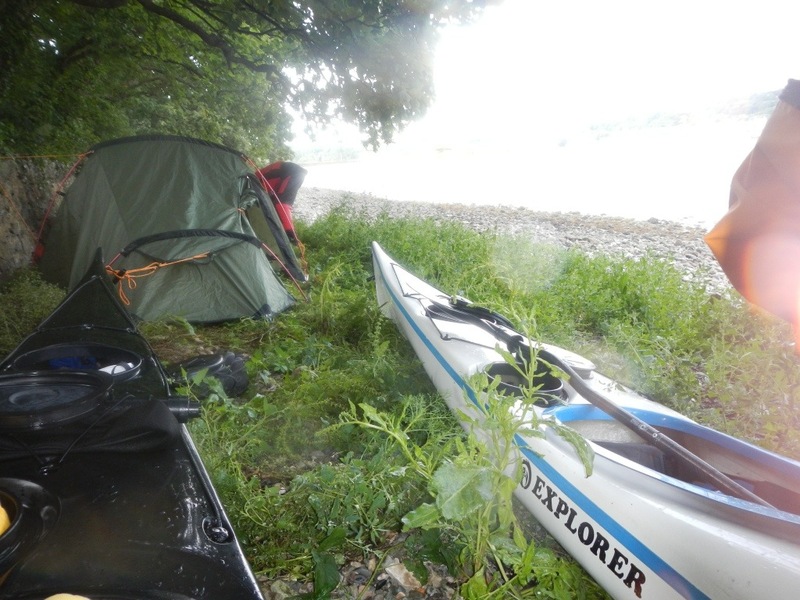 Not quite as salubrious as the previous nights accommodations but a lot nearer the water. 82 km’s in a day and a half, not too bad now only about 57 to go tomorrow! 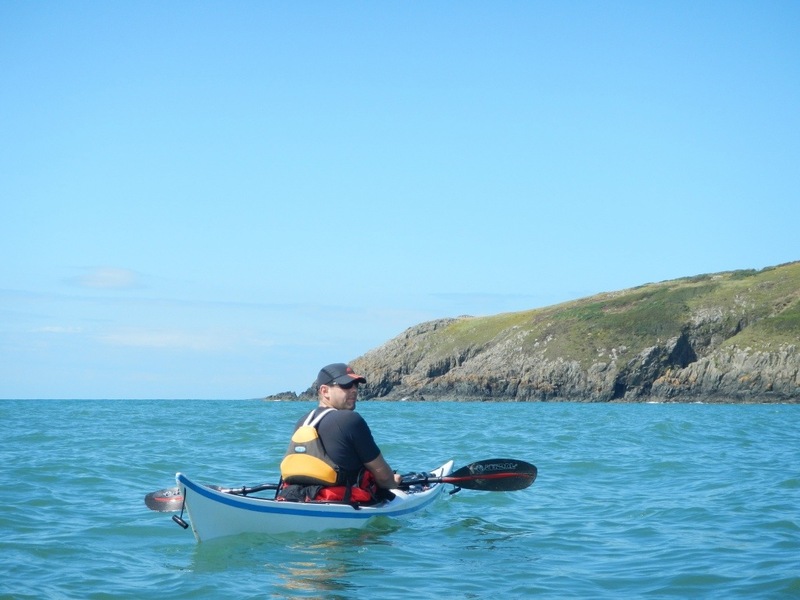 The trip around Anglesey by sea kayak is an absolute classic. It requires a good bit of planning, a reasonable level of skill and a healthy does of luck which is mostly to do with the weather. 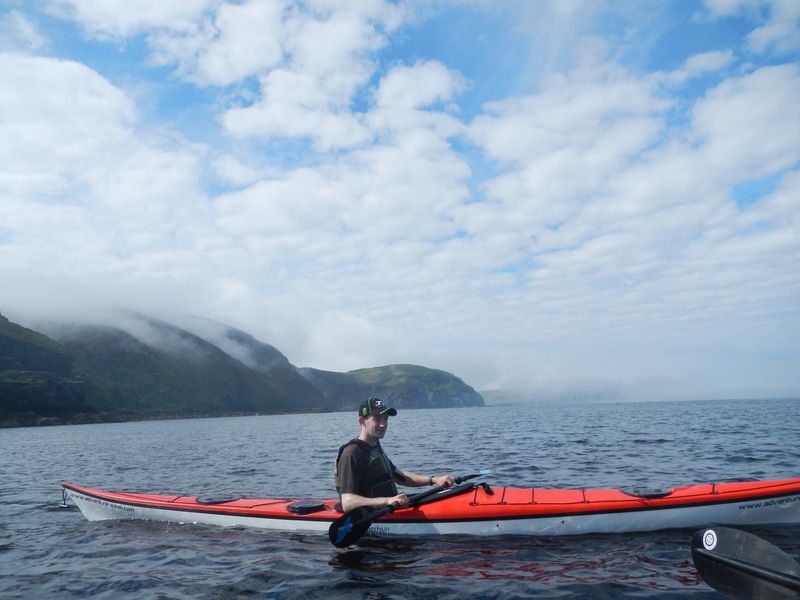 The record for a single kayak is held by John Willacy of performanceseakayak.co.uk in just under 10 hours! We were planning a more leisurely 3-4 days. 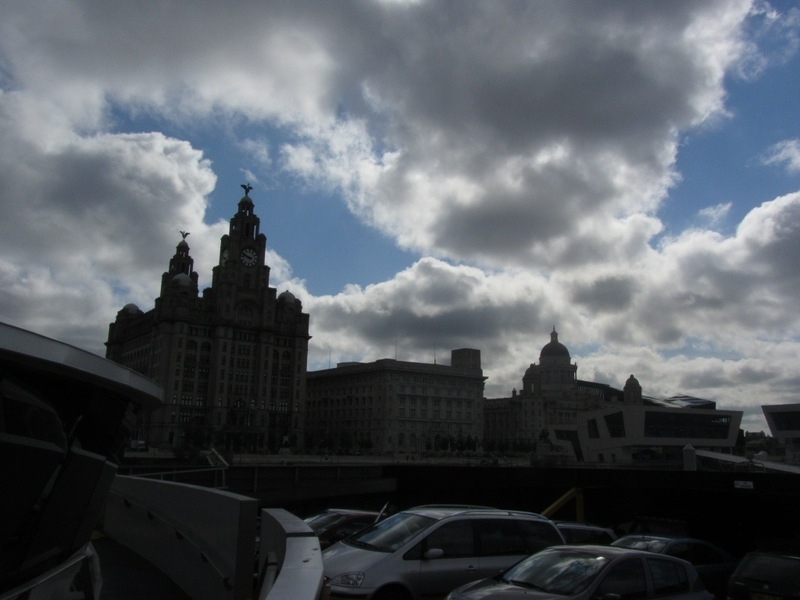 The team of myself and my cousin George made an early start on Friday morning to catch the fast craft sailing from the island to Liverpool. Arriving a couple of hours later in the heart of the city. 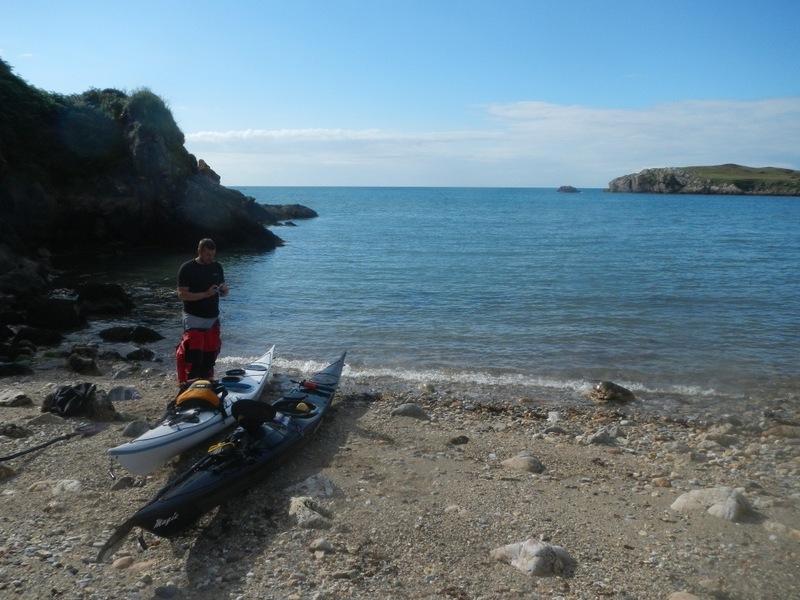 We made it to Holyhead around lunch time. 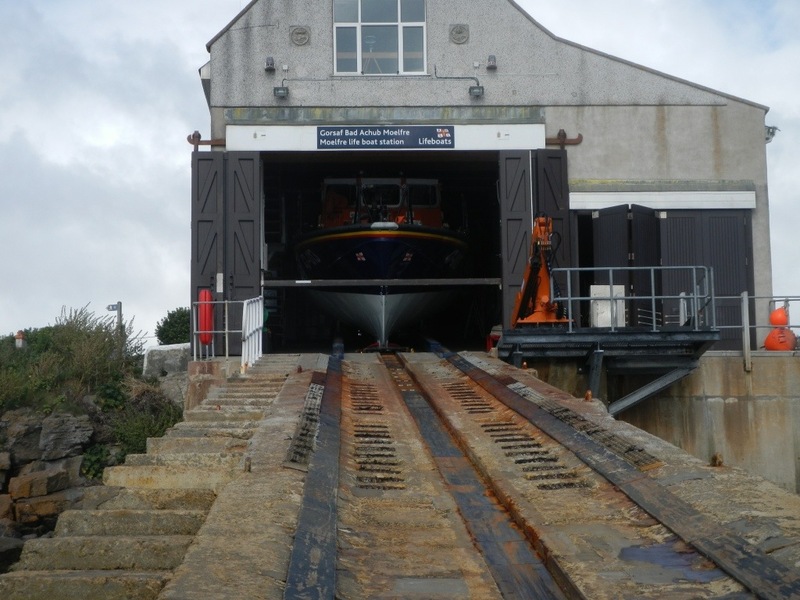 We wasted no time in packing the boats and launching from Holyhead harbour. 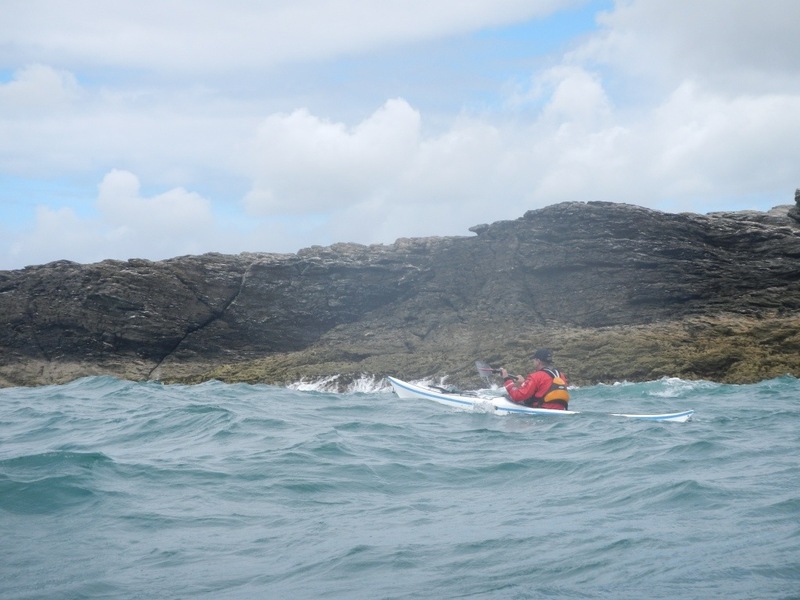 We had decided on a clockwise route to make the best of the tides and wind direction. 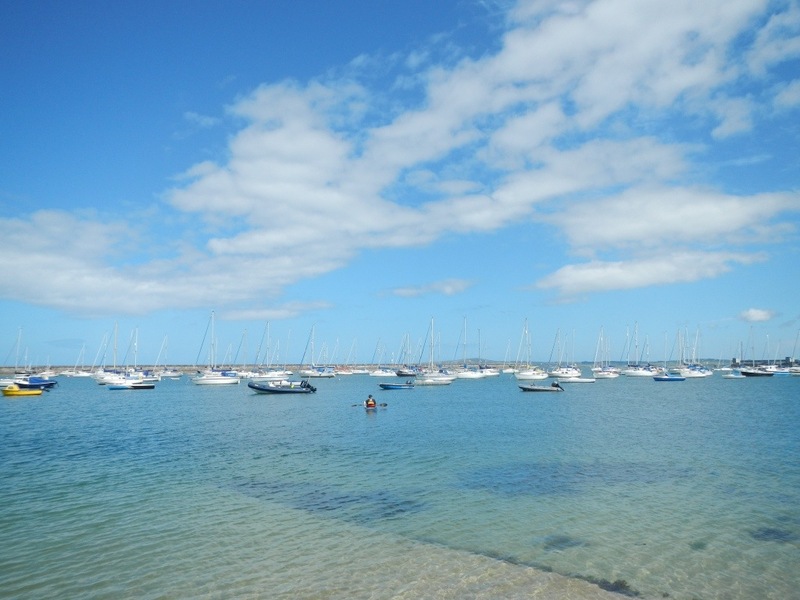 So after a quick dash across the harbour mouth, avoiding the large and fast moving ferries, we headed north with just a light breeze and sunny skies. 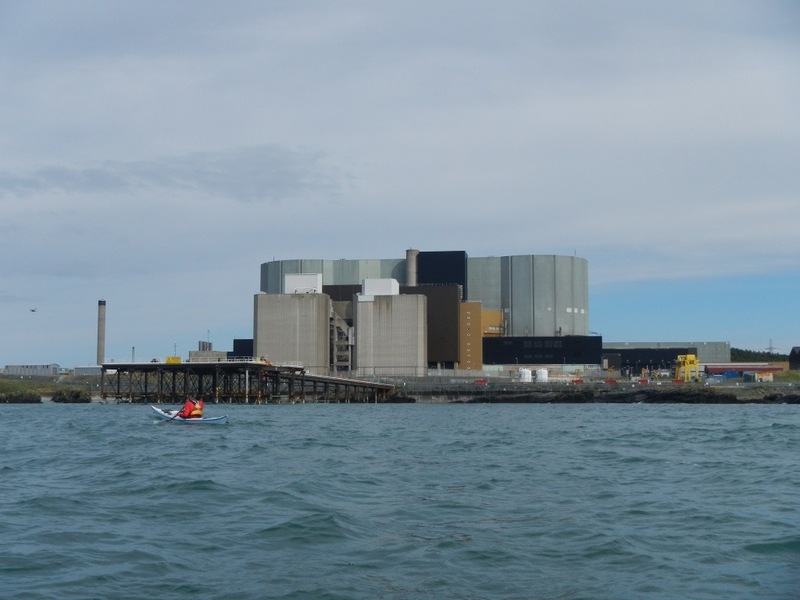 and the Wylfa power station. 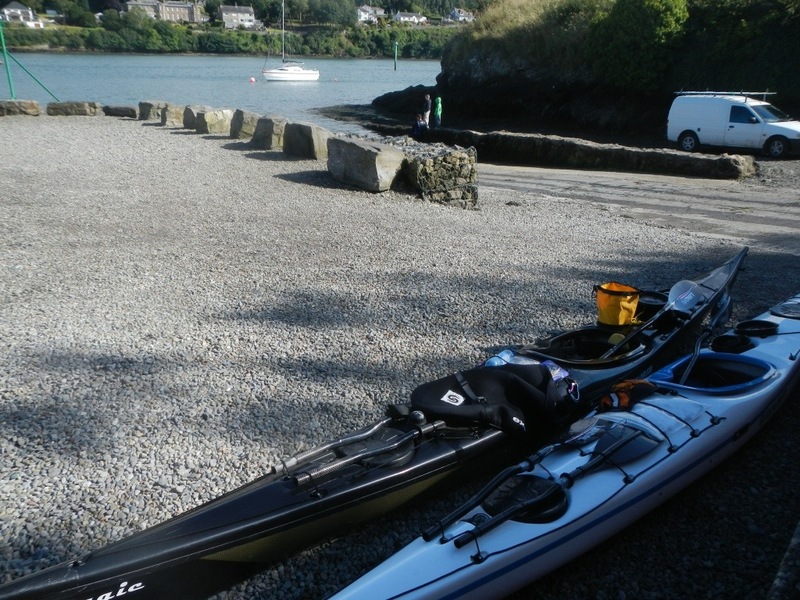 Our first stop was a small beach on the west of Cemaes bay. This would have been a great place to stay but there was plenty of light left so we decided to press on another 5k or so to Bull bay. 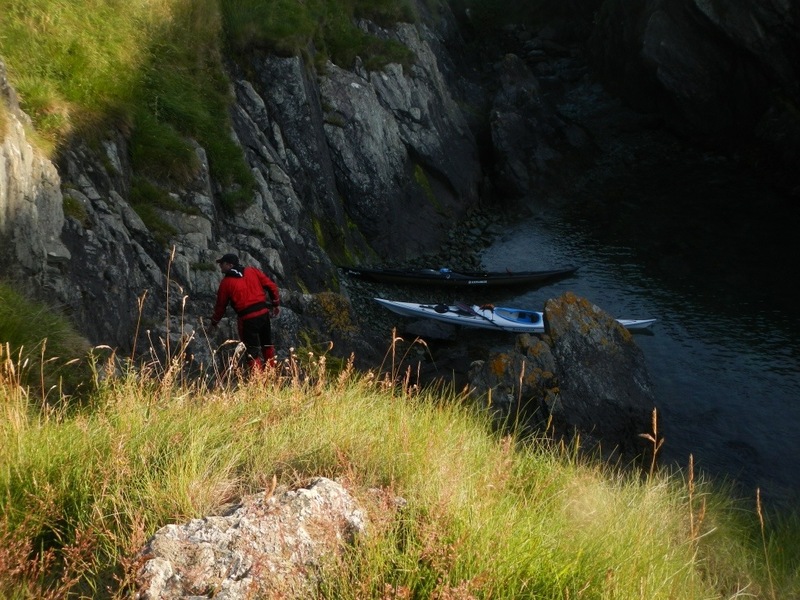 We had a bit of a search for a suitable get out but managed in the end to get a lovely cliff top spot. After setting the tents up we had a lovely meal of meatballs washed down with a vintage tesco value cardboard wine. and watched the amazing sunset. Not a bad afternoon. 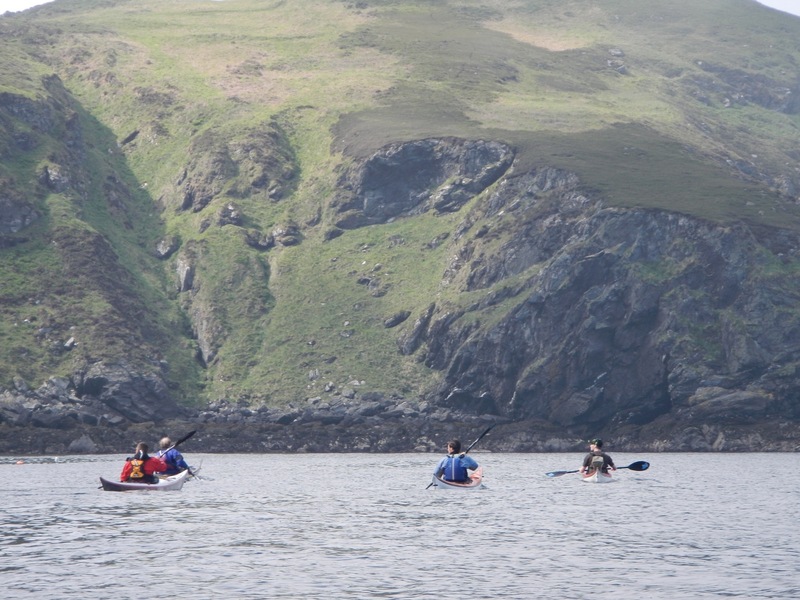 On the weekend of 16th June a dedicated group of teams gathered in the Isle of man for the annual Adventurous experiences adventure race. 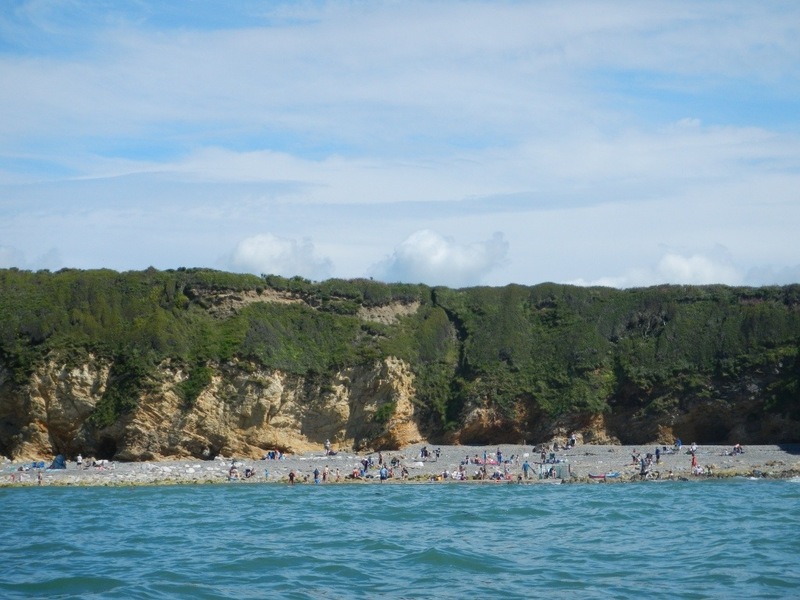 After battling through a sea swim, a sea kayak race, a mountain bike event, and a hill run, the crowds gathered for the grand finale of a gruelling rope climb. 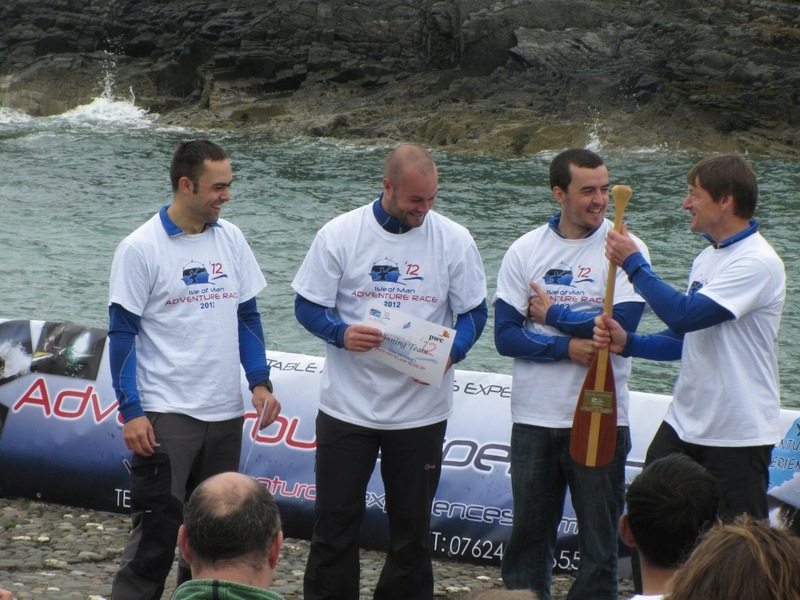 The event was deservedly won by “The Rockhoppers” who took the coveted winners paddle. Next years event is set to be even bigger with a new elite class running events back to back. 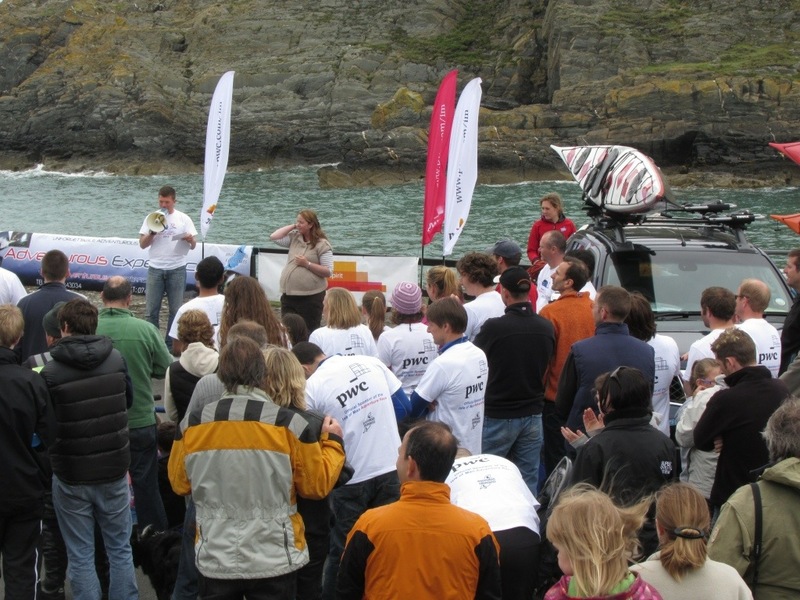 A massive thanks to all those who gave up their time to help organise and marshall the event. 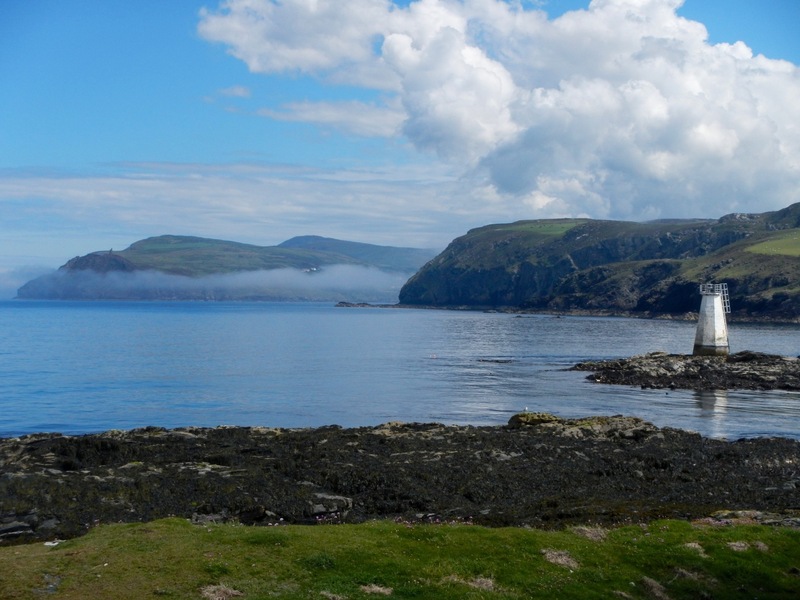 The castle in question is Milner’s tower in Port Erin. It was built in 1871 in honour of William Milner a local philanthropist. 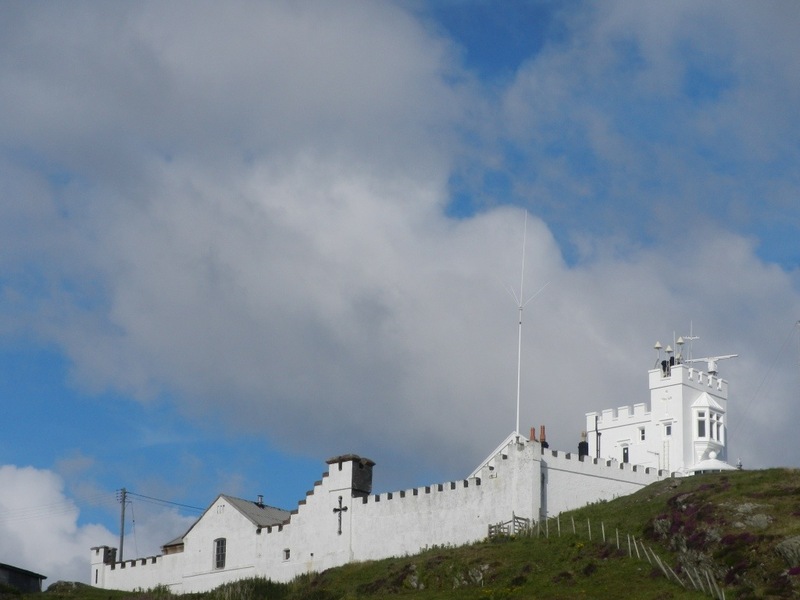 It stands high above the sea on top of the grand cliffs of Bradda Head. 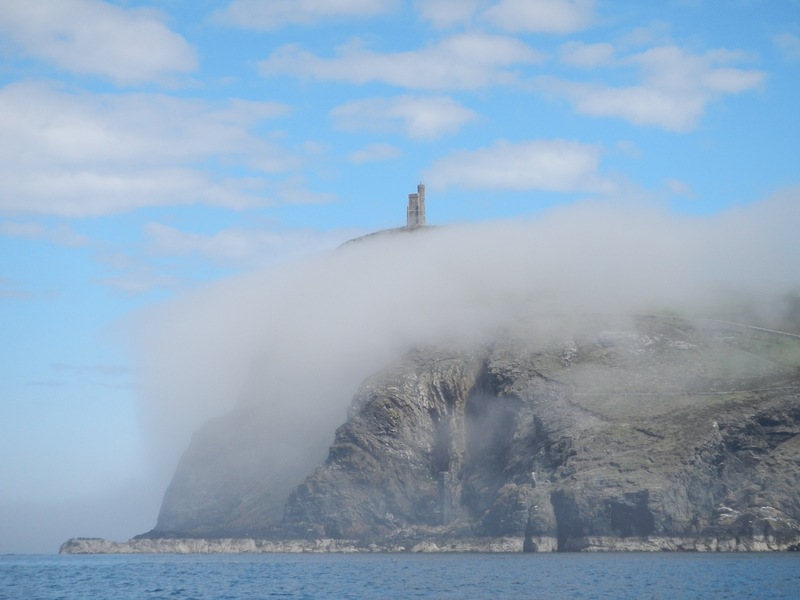 On this morning as we headed out the mist shrouding the cliffs in the bright sun gave a magical feel to the day. …along with a special guest. 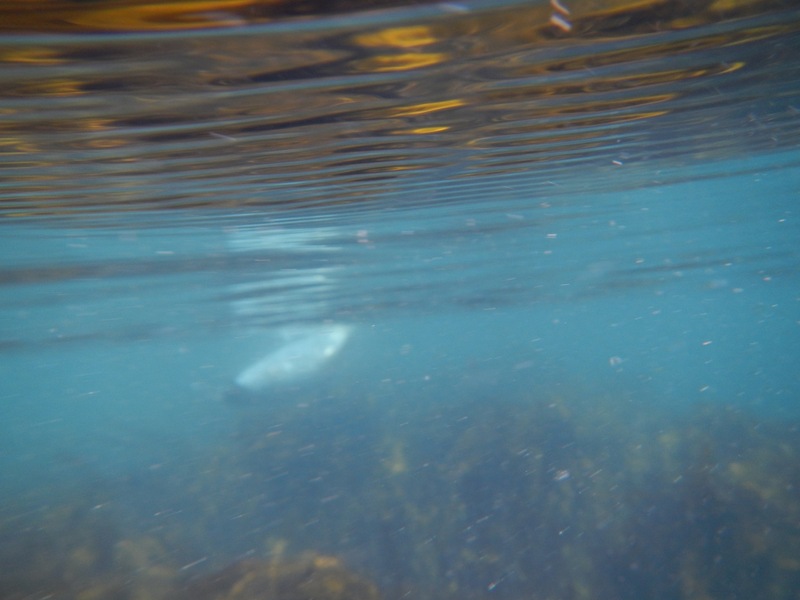 After crossing the sound, with very little tidal flow for a change, we landed on the Calf for a break and took in the view north from where we had come. 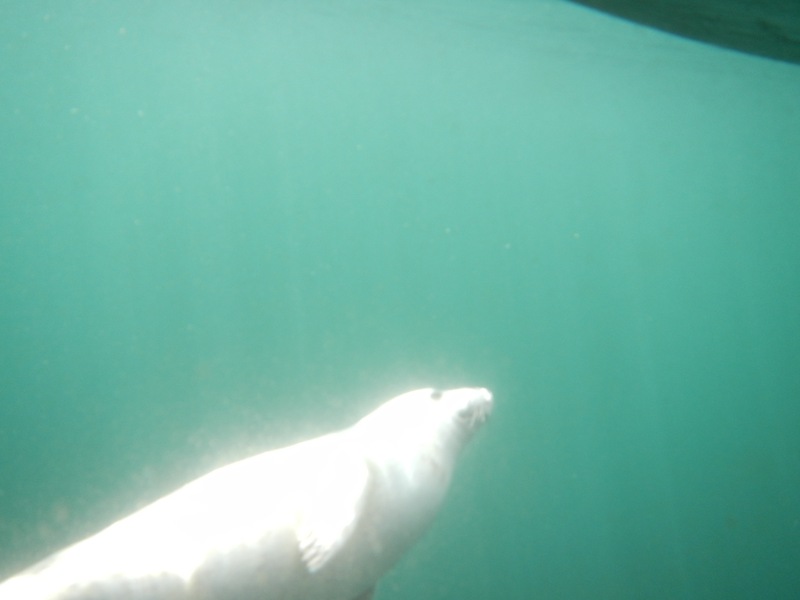 On our return journey we checked beneath the sound for the local grey seals. 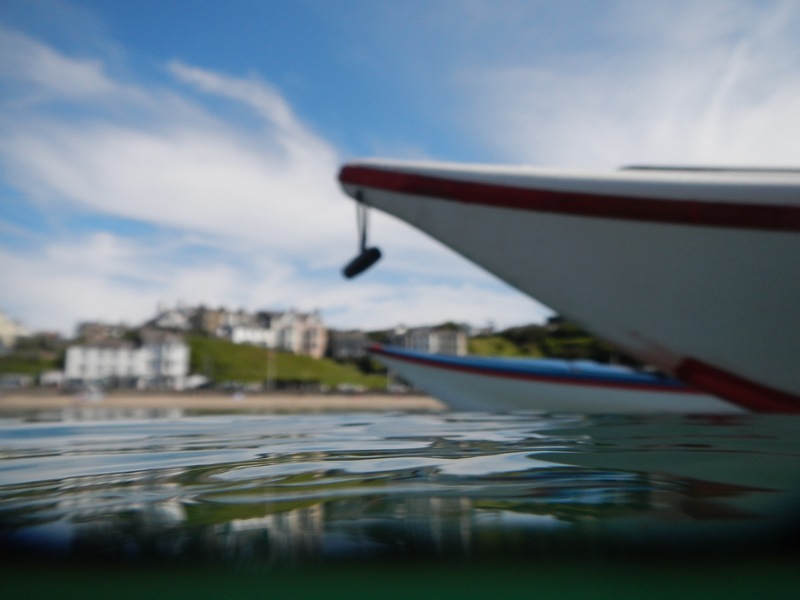 Finishing the trip back to a picturesque Port Erin bay.